What a beautiful little girl you are. How could anyone as sweet as you end up in a shelter? It did work out for the best and now you have a great home. Good morning, Rosie! Happy Dog of the Day to you, and Happy St. Patty's Day to you and your entire family! What a beautiful Schnoodle girl you are, Rosie, and judging by that big smile, one very happy and much loved girl at that! After seeing your heart-melting photos, reading your human's love filled tribute, there's no denying your family was truly blessed with the luck of the Irish, the day they welcome you into their home and hearts. But um, sounds more like you chose them! hehe Well, either way, it was clearly a case of love at first sight for you and your humans, and the rest is happy history! They just don't come any more beautiful, any sweeter or more loving than you, Rosie...the Ambassadog, the poster pup for doggie adoption; the perfect "first!" Your family is truly blessed, having a furkid as special as you to call their own! You're a treasure, Rosie, beautiful inside and out and so very deserving of your big day of honor! She was our first dog. When we went to meet the group of rescues that just arrived from the pound, she was the one that came right over to us, the others weren't so interested. If you get down to her level and say "Hugs! ", she runs up and puts her paws on your shoulder and snuggles in. She loves to be held so she can just feel taller! Thanks for the BIG smiles, sweet baby girl! Meeting you today, reading your heartwarming rags to riches story has been a real treat! I hope you're enjoying a very special, fun filled day of celebration, Rosie...running in your big backyard, playing fetch to your heart's content; watching the world go by from your window, giving and receiving countless hugs and kisses; chowing down on an extra serving of mashed potatoes, hehe; being loved and pampered to pieces! Lots of love, cuddles and smooches to you, precious Rosie, our very special and most deserving Dog of the Day, EVERY day! That smile says it all!!! Last edited by tatsxxx11; 03-17-2019 at 11:25 AM. Dearest Rosie, you are beautiful! What a sweetie you are! You have the most delightful personality, too. You are full of energy and make your dear people smile with your antics. You like to play ball and give hugs. We are so glad you were rescued from that high-kill shelter and then wound up with the wonderful family you did! You and they all love each other very much, don't you. What a delightful love-filled home you share! 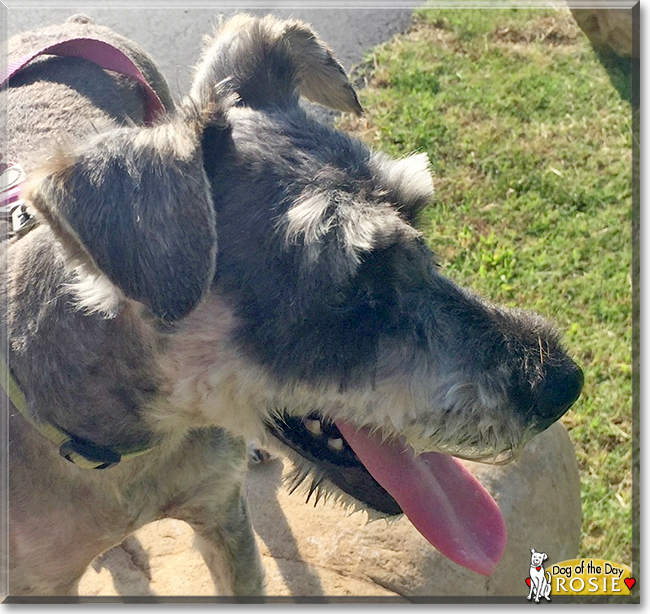 Congratulations, darling Rosie, on being chosen today's Dog of the Day! We hope you and your dear people and all your family and friends are enjoying a fine celebration, full of fun and lovies and all your favorite games and treats. Rosie couldn't be more beautiful! I am sure that all the love and attention she is receiving will address her anxieties and they will be a distant memory very soon. Aww, Rosie deserves the best and is getting the best, she is the very best DOTD! Congratulations on being Dog of the Day, beautiful Rosie!